Since 1778, guests have sought the tranquility of The Greenbrier for health and rejuvenation. American presidents, world leaders, and the who’s-who of Hollywood have graced the ballrooms of this historic and luxurious resort. First coveted for the healing properties of the sulphur springs found in the region, The Greenbrier invites visitors to immerse themselves in an array of activities and indulgences, which, notably, still includes a sulphur mineral soak at its world-renowned mineral spa. Despite many of its modern amenities, The Greenbrier holds fast to its history and the iconic 1940s glamour introduced by interior designer Dorothy Draper after WWII. The concierge staff is as accustomed to booking an off-road driving lesson as it is to inviting guests to afternoon tea. You’ll need to dress for dinner at the Main Dining Room, but let that shirt tail fly for an afternoon of paintball, zip-lining or falconry. At The Greenbrier, special attention is paid to blending past with present, creating a destination experience found nowhere else. With amenities and activities so exclusive, many assume you’ll need to be a guest to gain access to the opulence of The Greenbrier. Not so! Day visitors are welcome to peruse the main halls and grounds, dine in the finest restaurants, and participate in a multitude of activities scheduled each day. Dining is an imaginative venture intended to captivate and surprise. Under the direction of Executive Chef Bryan Skelding and Executive Pastry Chef Jean-Francois Suteau, the resort’s 20 restaurants, cafés and lounges including seasonal venues serve dishes as artful as they are delicious. Jean-Francois Suteau, The Greenbrier’s esteemed executive pastry chef is a 15th generation baker from Nantes, France. His family has been in the business of sweet delight since 1752. Fast forward to modern day, Suteau has made a name for himself in every corner of the U.S. where he has baked for some of the most revered restaurants and resorts. Last year he was a finalist in the Food Network’s Best Baker in America series. His creations can be found on every menu at The Greenbrier. It’s no secret today, but beneath the West Virginia Wing of the hotel, a Cold War fallout shelter was built in 1962 by the U.S. government intended to house Congress in the event of a national disaster. Daily Bunker Tours open the door—25 tons!— to a fascinating era of American history. There would be no Greenbrier if not for the historical significance and notable benefits of White Sulphur Springs’ healing waters. The resort’s Mineral Spa originates from that reputation, focusing on hydrotherapy and the use of natural essences and minerals found on the property to provide its unique therapeutic treatments. Take it outside! See what it’s like to climb a 55-foot tower or navigate The Greenbrier’s Aerial ADdventure Course. For those who prefer terra-firma, head off-roading in a Jeep Wrangler Rubicon, fly fish Howard’s Creek, or try your hand at falconry, the sport of kings. The Greenbrier’s Casino Club is two parts high-stakes excitement and three parts possibility. Guests of the hotel can try their luck at any of the 37 tables, including blackjack, roulette and poker, while an astounding 320 slot machines challenge you to beat the odds. Several golf courses surround and meander the 11,000-acre grounds of The Greenbrier. Among them, the Old White TPC, home to a PGA TOUR FedEx Cup Event set to playout in September this year. The Ashford Short Course, which opened last year, offers guests a tighter, faster, 9-hole game designed around the world’s most famous holes. History buffs will find plenty to occupy their imaginations. Henry Clay, who visited frequently through the early 1800s, is said to have made the resort famous. 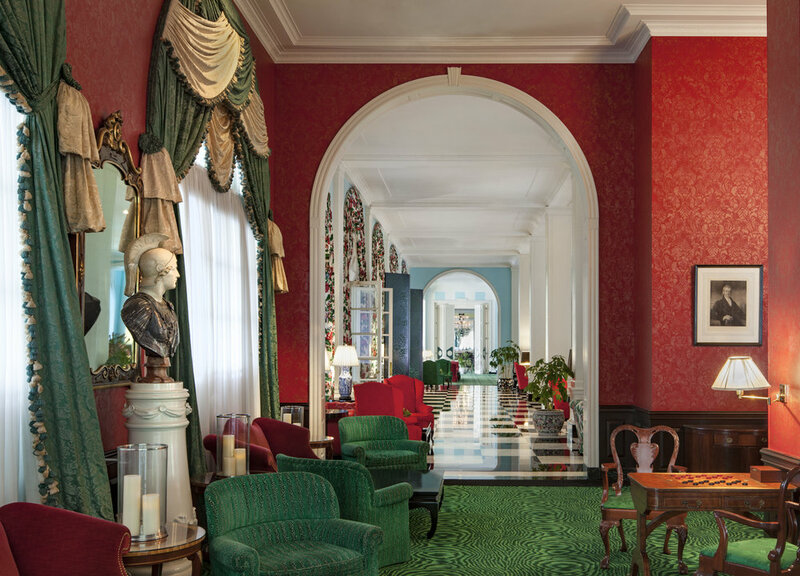 Since then, many presidents, dignitaries, and the most famous of high society have paid a visit to the iconic Greenbrier. We welcome you to join in their footsteps.